The idea here is that some people that suffer the misfortune and inconvenience of being stabbed in the abdomen will require a surgical laparotomy. On the other hand, some will not. We don't want to miss the ones that do, but we don't want the latter to get unnecessary operations. If the wound does not penetrate so deep as to violate the peritoneum then there is low risk of intraabdominal organ injury. 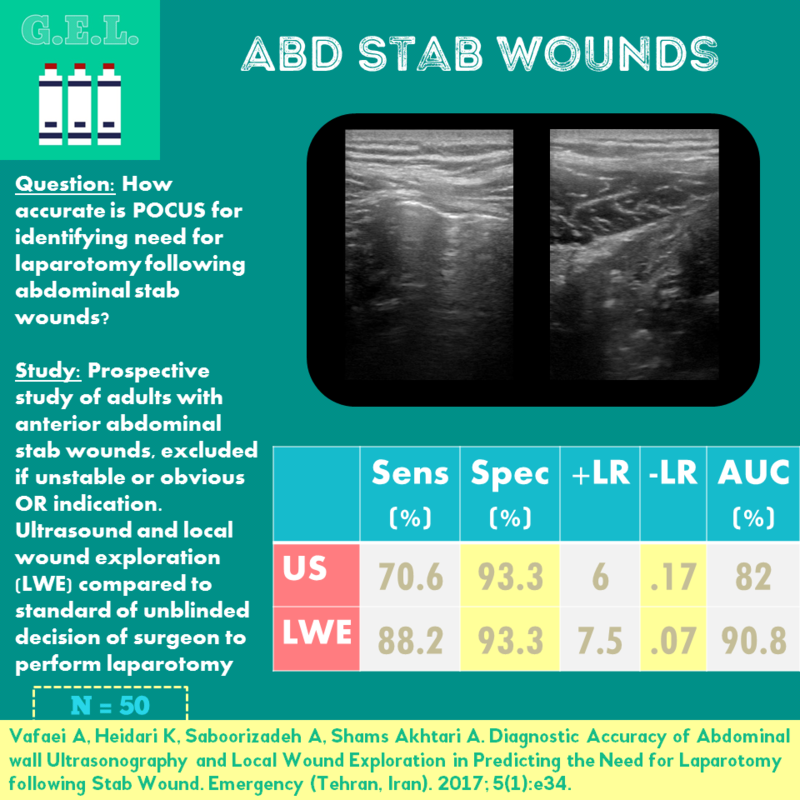 Instead of probing and exploring the wound which can be painful, perhaps ultrasound can offer a less invasive way of determining whether or not the peritoneum was violated. Feeling out of breath or having trouble breathing (AKA dyspnea) is a common complaint in the emergency department. We know already that ultrasound can diagnose a number of things that can cause this symptom. 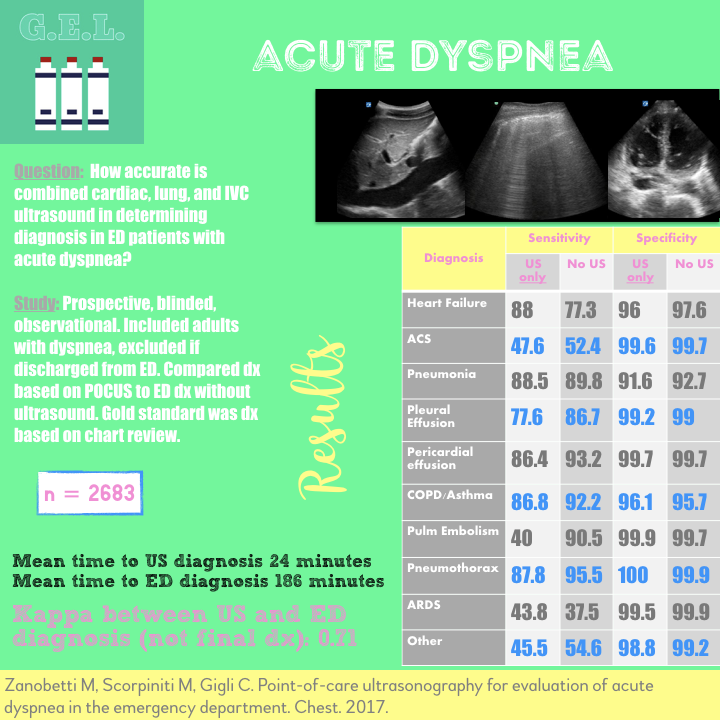 This paper takes a look to see how ultrasound can help out the evaluation of a patient who presents with acute dyspnea. More specifically, it looks at the accuracy of diagnosis and time to making the diagnosis compared to an evaluation without ultrasound. The eye was made to ultrasound - it is fluid filled and easy to find. Ultrasound can be used to diagnose many causes of acute visual complaints. This is important because often times a) comprehensive dilated fundoscopy is not feasible and b) there are no ophthalmologists around. So how good is it? 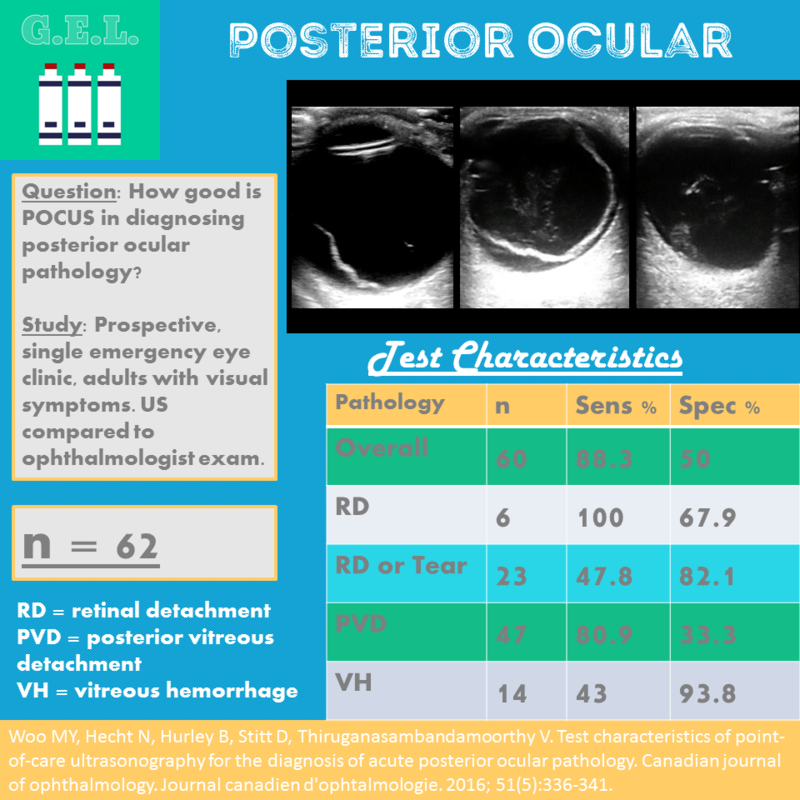 This study compares point of care ultrasound to an ophthalmologists exam in diagnosing posterior ocular pathology such as retinal detachment, vitreous detachment, and vitreous hemorrhage.